Brendan Clarke; Ger O'Brien (Michael Barker 50), Shane McEleney, Darren Dennehy, Ian Bermingham; Graham Kelly (Conan Byrne 77), Keith Treacy (Sam Verdon 86), David Cawley, Mark Timlin, Billy Dennehy; Christy Fagan. Micheal Schlingermann; Tobi Adebayo-Rowling, Michael Leahy, Gary Boylan, Regan Donelon; Kieran Sadlier (Mikey Place 87), Jimmy Keohane, Craig Roddan, John Russell (Jordan Richards 70); Liam Martin: Jaanai Gordon (Raffaele Cretaro 70). 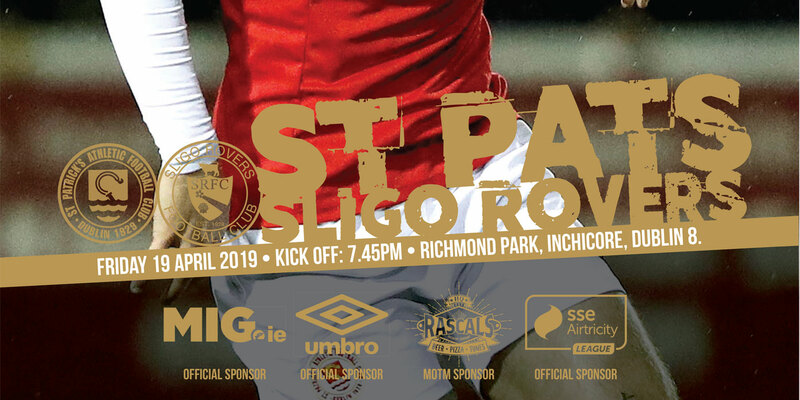 A second half goal from Christy Fagan denied Sligo Rovers the chance to move from joint-bottom of the SSE Airtricity League Premier Division as Saint Patrick's Athletic drew 1-1 with the Bit O'Red at Richmond Park. Gary Boylan's first goal for the Showgrounds side had put Rovers ahead minutes before the break. But Fagan's headed goal on 65 restored parity. The Saints had to rely on man of the match Brendan Clarke who denied both Kieran Sadlier and Jimmy Keohane with two wonderful saves either side of the break. Sligo started on the front foot and the Inchicore side depended on a well positioned Billy Dennehy, who blocked John Russell's drive from 15 yards on eleven minutes. The Galway man meeting Sadlier's corner from the right but Dennehy was alert to clear Russell's goal-bound effort. Jaanai Gordon was presented with a decent opportunity to send Sligo into the lead just past the quarter hour mark. Fagan's miss-placed pass from inside his own half ran into the path of the West Ham loanee who, under pressure from Keith Treacy, could only hit the oncoming Clarke who cleared the ball to safety. Pat's enjoyed plenty of possession inside their own half early on but struggled to create any meaningful chances throughout the first period. It wasn't until 26th minute before Sligo net minder Micheal Schlingermann was called into action. The Mayo was man comfortable in diving on to Billy Dennehy's shot from the edge of the Rovers area. Clarke was on hand to deny the Bit O'Red once more on 32. Keohane did well hold up play on the Rovers right before finding Sadlier. The Republic of Ireland youth international in turn teed up Gordon whose header from a stooped position was acrobatically tipped away by the agile goalkeeper. The away side captured the lead three minutes short of the break. Darren Dennehy caught Sadlier with a late challenge in front of the Pat's penalty area. Clarke was only able to push the 21-year-old's resulting free into the path of Boylan. The Belmullet native reacted quickest and wriggled free of the attentions of Mark Timlin to slot home from close range for his maiden goal for the club. Pat's started the second half brightly but had to once more rely on Clarke to deny Sligo's second on 55. 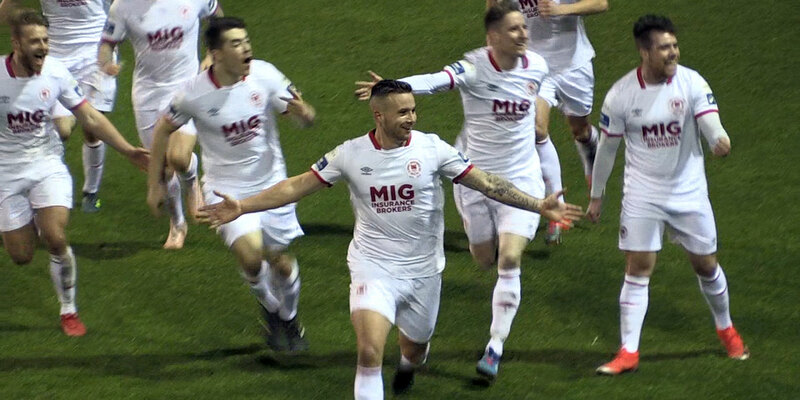 Schlingermann dealt with Darren Dennehy's corner at the opposite end before a lofted ball forward from the Rovers number one sent Sadlier down the Saints right. Sadlier's cross was met by Keohane who saw his half volley pushed away by the attentive Clarke. Treacy's vicious right footed effort had too much behind it on the hour mark for Pat's while the lively Sadlier could only drag his effort wide of the far post two minutes later. Liam Buckley's charges levelled the game on 65. Facing his former employers, David Cawley's over-cooked cross from the right was kept in play by Ian Bermingham. The full back's cross was met by Fagan who nodded powerfully past Schlingermann for his fifth goal of the campaign. Shane McEleney's block tackle on Keohane kept the game level on 76 minutes. 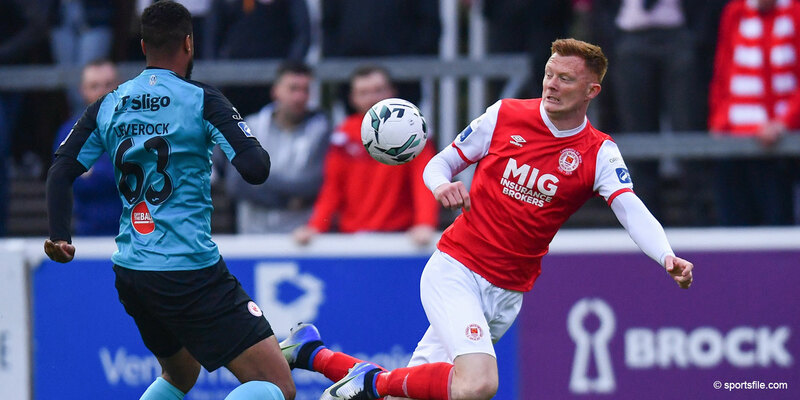 Sligo substitute Raffaele Cretaro chested Regan Donelon's ball from deep into the path of the former Exeter City midfielder who saw his drive deflected away by a brave challenge from the former Derry man. The result sees Sligo move level with Longford Town who face Dundalk on Saturday night, while Pat's have the chance to go third should they beat Finn Harps on Monday night.